Nenthead (NGR: NY 782 437) is a small Cumbrian village high up in the Northern Pennines, on the border with Northumberland and Durham. Because of its accessible lead and zinc mine workings, it has become a Mecca for mine historians and explorers. 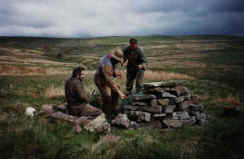 Surface remains and underground workings are now in the hands of the North Pennines Heritage Trust who have opened the surface remains and Carr's Level to the public. 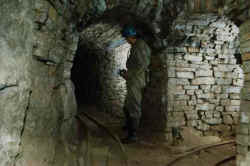 Experienced and equipped groups are welcome to enter some of the mines after booking in at the Heritage reception. 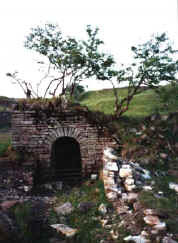 Spectacular stone arched levels were constructed to give access to the workings and this method of support was so successful that the vast majority of these levels survive intact. 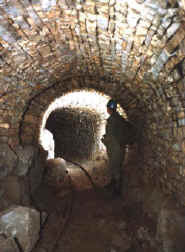 Lead ore was found in vertical veins and horizontal "flats" or lodes; ore chutes conveyed the lead ore down to the horse levels where tubs pulled by horses trammed it to the surface. 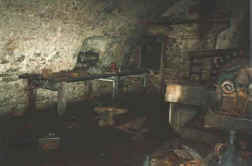 Many engineering artefacts survive within the mines including water wheels, Pelton wheels, ventilation fans, tools, etc. 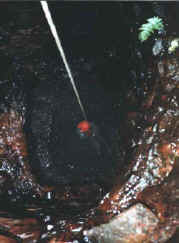 As the mines are extensive you need to be prepared for a long trip in wet conditions as the horse levels usually contain water from a few inches to several feet deep. The Derbyshire Caving Club make regular visits to Nenthead along with members of the Wirksworth Mines Research Group (WMRG) and have been responsible for finding and extending many of the mines in this region. There are several caves in the limestone around this forgotten region these appear in the guide book "Northern Caves" Volume 5, The Northern Dales. Although most are only small the Great Limestone in this area is about 60 foot deep and the caves discovered were never dug so the potential for extensions awaits! 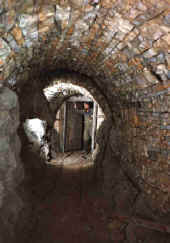 Some more pictures of the mines in Nenthead (all photos on this page are copyright Pete Johnson DCC).